Trying to contribute to the survival of a rare breed and its future is no easy feat. It is not a money making issue. Should you one day decide you would like to have one and contribute... please keep that in mind. It's all uphill. BUT. After a few years, when you can say and see the results, it's a real joy. When my production produces and the results are satisfactory, this means in 3 generations and I have managed to make "Vieux Barbet Français" that correspond to the 1930's type and that I can continue then, I will be happy.I am happy. That means that people look at my dogs and know that they are my production. They will hopefully be slightly different from another breeder's! Saying that you want to make healthy dogs is quite obvious. But they have to be healthy and correspond to the standard and not what some interpret it as being. 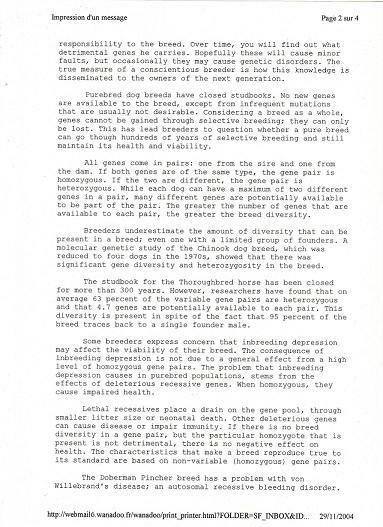 You need to be as informed as possible on the history and health issues of the breed and as I keep saying , "If I knew 2, 3, 5 years ago what I know now..." but don't we all say that? Or at least some of us? From not being able to get real answers from some, I decided to find the answers myself. That's not the easy way to do it, but at least we hope to not continue paying for others's mistakes. I have found you some information that I have, others have it too, but being human, we quickly forget we read it and then one day, it's too late. We done blew it. So we have to be reminded regularly before we go off track. Here is some information from Pr. Denis, with whom I have communicated. 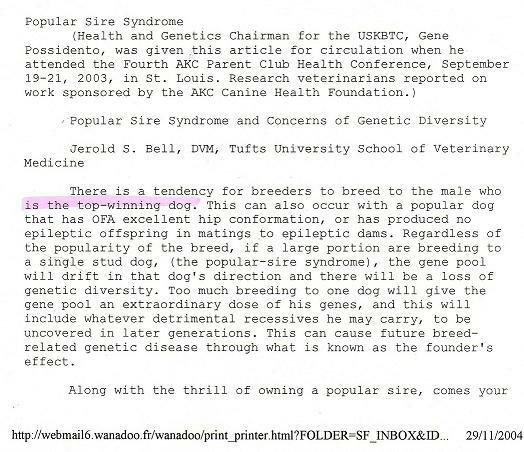 He is French, knows what happened to the Barbet for real and knows about genetic diversity or he wouldn't be talking about it! 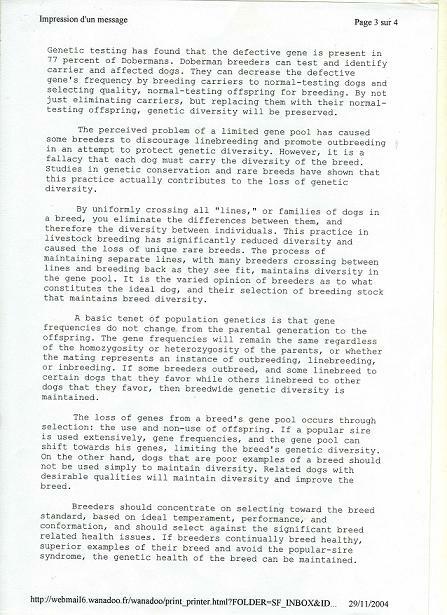 ]Then, some information sent to me by a Canadian breeder in 2004. The Barbet is becoming more and more popular abroad and this is when it gets dangerous....Enjoy!